وحدت آزاد, نادر, ابراهیمی, سعید, لیاقت, غلامحسین. (1396). بهینه سازی و آنالیز حساسیت جذب انرژی هسته ساندویچی مخروطی در برخورد مورب. علوم و فناوری کامپوزیت, 4(1), 25-34. نادر وحدت آزاد; سعید ابراهیمی; غلامحسین لیاقت. "بهینه سازی و آنالیز حساسیت جذب انرژی هسته ساندویچی مخروطی در برخورد مورب". علوم و فناوری کامپوزیت, 4, 1, 1396, 25-34. وحدت آزاد, نادر, ابراهیمی, سعید, لیاقت, غلامحسین. (1396). 'بهینه سازی و آنالیز حساسیت جذب انرژی هسته ساندویچی مخروطی در برخورد مورب', علوم و فناوری کامپوزیت, 4(1), pp. 25-34. وحدت آزاد, نادر, ابراهیمی, سعید, لیاقت, غلامحسین. بهینه سازی و آنالیز حساسیت جذب انرژی هسته ساندویچی مخروطی در برخورد مورب. علوم و فناوری کامپوزیت, 1396; 4(1): 25-34. در این مقاله خصوصیات جذب انرژی پروفیل مخروطی با هسته ساندویچی در برخورد مورب با دیواره سخت با روش المان محدود غیرخطی مورد بررسی قرار می­گیرد. میزان جذب انرژی در این فرآیند تا حد زیادی به اثر برهم کنش بین هسته ساندویچی و دیواره خارجی، و همچنین جنس و هندسه موادی که وارد ناحیه تغییر شکل پلاستیک می­شوند بستگی دارد. بدین منظور ویژگی­های مربوط به جذب انرژی و تأثیر پارامتر زاویه برخورد و ضخامت مورد توجه است. به‌منظور کاهش هزینه محاسباتی در مدل‌سازی مچالگی بر پایه نتایج حاصل از روش المان محدود، توابع درجه سه جذب انرژی مخصوص و ماکزیمم نیروی مچالگی با استفاده از روش پاسخ سطح تعیین می­شوند. نتایج حاصل از تحلیل برخورد نشان می­دهند که با افزایش زاویه برخورد و کاهش ضخامت پروفیل مخروطی هسته ساندویچی، جذب انرژی مخصوص کاهش می­یابد. همچنین، با افزایش زاویه برخورد و افزایش ضخامت، بیشینه نیروی مچالگی کاهش می­یابد. در ادامه، بهینه­سازی چندهدفه برای بیشینه کردن جذب انرژی مخصوص و کمینه کردن بیشینه نیروی مچالگی اعمال می‌شود. مسأله بهینه­سازی دوم در جهت بیشینه شدن همزمان جذب انرژی مخصوص و زاویه برخورد می­باشد. در بخش نهایی، آنالیز حساسیت موضعی و جامع برای توابع جذب انرژی مخصوص و ماکزیمم نیروی مچالگی بر حسب پارامترهای مورد مطالعه زاویه برخورد و ضخامت مطالعه شده است. نتایج نشان می­دهند که حساسیت جامع تابع جذب انرژی مخصوص نسبت به زاویه برخورد بیشتر از ضخامت پروفیل می­باشد، در حالیکه حساسیت جامع تابع بیشینه نیروی مچالگی نسبت به ضخامت بیشتر از زاویه برخورد است. In this paper, crashworthiness analysis of a tapered sandwich column under oblique impact loading against a rigid wall is investigated by nonlinear finite element analysis.The energy absorption characteristics of honeycomb sandwich cylindrical columns in oblique crushing process depend greatly on the amount of material which participates in the plastic deformation. The interaction effects between the honeycomb and column walls greatly improve the energy absorption efficiency. The response surface method with cubic basis functions is employed to formulate specific energy absorption and peak crushing force, which reduces considerably the computational cost of crush simulations by finite element method. Based on the results of crash modeling, it is observed that the specific energy absorption has a decreasing trend by increasing the impact angle and decreasing the column thickness. On the other hand, the peek crushing force reduces when the impact angle and the column thickness are increased. Therefore, multiobjective optimization is done to maximize the specific energy absorption and minimize the peek crushing force at the same time. Furthermore, maximizing the specific energy absorption and maximizing impact load angle is performed. Finally, both local and global sensitivity analyses are employed to assess the effect of impact angle and thickness on the specific energy absorption and peak crushing force. The global sensitivity of the specific energy absorption with respect to the impact angle is observed to be more than the column thickness, while the peak crushing force has more global sensitivity to the column thickness compared to the impact angle. Gupta, N.K. Easwara Prasad, G.L. and Gupta, S.K., “Plastic Collapse of Metallic Conical Frusta of Large Semi-Apical Angles,” International Journal of Crashworthiness, Vol. 2, No. 3, pp. 456-67, 1997. Reid, S.R. and Reddy, T.Y., “Static and Dynamic Crushing of Tapered Sheet Metal Tubes of Rectangular Cross-Section,” International Journal of Mechanical Sciences, Vol. 28, No. 1, pp.117-125, 1986. Nagel, G.M. and Thambiratnam D.P., “Dynamic Simulation and Energy Absorption of Tapered Tubes under Impact Loading,” International Journal of Crashworthiness, Vol 9, No. 2, pp.17-28, 2004. Shariati, M. Davarpa nah, M. Chavoshan, H. and Allahbakhsh, H.R., “Numerical and Experimental Investigations on Buckling and Control Amount of Energy Absorption of Stainless Steel 304L Shells with Various Shapes under Axial Loading,” in Persian, Modares Mechanical Engineering, Vol. 14, No. 3, pp. 60-68, 2015. Lee, S.H. Kim, H.Y. and Oh, I.S., “Cylindrical Tube Optimization using Response Surface Method Based on Stochastic Process,” Journal of Materials Processing Technology , Vol. 130–131, No. 6,pp. 490–6, 2002. Chiandussi, G. and Avalle, M., “Maximization of the Crushing Performance of A Tubular Device by Shape Optimization,” Computers & Structures, Vol. 80, No. 1, pp. 2425–32, 2002. Avalle, M. Chiandussi, G. and Belingardi, G., “Design Optimization by Response Surface Methodology: Application to Crashworthiness Design of Vehicle Structures,” Structural and Multidisciplinary Optimization, Vol.24, No. 4, pp. 325–32, 2002. Kim, H.S., “New Extruded Multi Cell Aluminum Profile for Maximum Crush Energy Absorption and Weight Efficiency,” Thin-Walled Structures, Vol. 40, No. 7, pp. 311–27, 2002. Acar, E. Guler, MA. Gerçeker, B. Cerit, M.E. and Bayram, B., “Multiobjective Crashworthiness Optimization of Tapered Thin-Walled Tubes with Axisymmetric Indentations,” Thin-Walled Structures, Vol. 49, No. 12, pp. 94-105, 2011. Alisadeghi, M. and Fazilati, J., “Optimization of Honeycomb Impact Attenuator using Genetic Algorithm Based on Response Surface Method and Design of Experiment; Part II: Optimization,” in Persian, Modares Mechanical Engineering, Vol. 15, No. 12, pp. 37-45, 2015. Darvizeh, A. Darvizeh, M. Ansari, R. and Meshkinzar, A., “Effect of Low Density, Low Strength Polyurethane Foam on The Energy Absorption Characteristics of Circumferentially Grooved Thick-Walled Circular Tubes,” Thin-Walled Structures, Vol. 71, No. 10, pp. 81–90, 2013. Darvizeh, A. Darvizeh, M. Ansari, R. and Meshkinzar, A., “Analytical and Experimental Investigations into The Controlled Energy Absorption Characteristics of Thick-Walled Tubes with Circumferential Groove,” Journal of Mechanical Science and Technology, Vol. 28, No. 10, pp. 4199-4212, 2014. Naddaf Oskouei, A. Khodarahmi, H. and Sohrabi, M., “Experimental and Numerical Study of Conical Thin Shells Collapse under Dynamic Axial Loadings,” in Persian, Modares Mechanical Engineering, Vol. 15, No. 7, pp. 392-402, 2015. Borvik, T. Hopperstad,O.S. Reyes, A. Langseth,M. Solomos, G. and Dyngeland, T., “Empty and Foam Filled Circular Aluminum Tubes Subjected to Axial and Oblique Quasi Static Loading,” International Journal of Crashworthiness, Vol. 8, No. 4, pp.481-94, 2003. Reyes, A. Langseth, M. and Hopperstad, O.S., “Square Aluminum Tubes Subjected to Oblique Loading,” International Journal of Impact Engineering, Vol. 28, No. 3, pp. 1077-106, 2003. Tarlochan, F. Samer, F. Hamouda, A.M.S. Ramesh, S. and Khalid, K., “Design of Thin Wall Structures for Energy Absorption Applications: Enhancement of Crashworthiness Due to Axial and Oblique Impact Forces,” Thin-Walled Structures, Vol. 71, No. 6, pp. 7-17, 2013. Qi, C. Yang, S. Dong, F., “Crushing Analysis and Multiobjective Crashworthiness Optimization of Tapered Square Tubes under Oblique Impact Loading,” Thin-Walled Structures, Vol. 59, pp.103–119, 2012. Reyes, A. Hopperstad, O.S. and Langseth, M., “Aluminum Foam-Filled Extrusions Subjected to Oblique Loading: Experimental and Numerical Study,” International Journal of Solids and Structures, Vol.4, No. 5-6, pp. 1645–1675, 2004. Reyes, A. Hopperstad, O.S. and Langseth, M., “Crashworthiness of Aluminum Extrusions Subjected to Oblique Loading Experiments and Numerical Analyses,” International Journal of Mechanical Sciences, Vol. 44, pp. 1965–1984, 2002. Nagel, G., “Anumerical Study on the Impact Response and Energy Absorption of Tapered Thin-Walled Tubes,” International Journal of Mechanical Sciences, Vol. 46, No. 2, pp. 201–216, 2004. Nagel, G. and Thambiratnam, D., “Computer Simulation and Energy Absorption of Tapered Thin-Walled Rectangular Tubes,” Thin-Walled Structures, Vol. 43, No. 8, pp. 1225–1242, 2005. Nagel, G. and Thambiratnam, D., “Dynamic Simulation and Energy Absorption of Tapered Thin-Walled Tubes under Oblique Impact Ioading,” International Journal of Impact Engineering, Vol. 32, No. 10, pp. 1595–1620, 2006. Niknejad, A. and Liaghat, G., “Experimental Study of Polyurethane Foam Filler on Hexagonal Honeycomb Structure Behavior under Axial Load with Constant Rate,” in Persian, 10th Iran Aerospace Conference, Tarbiat Modarres University, 2011. 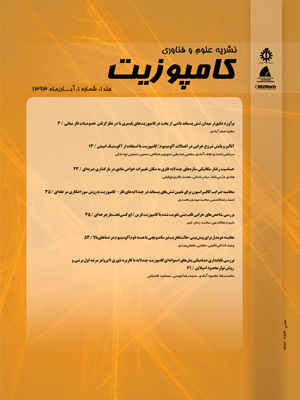 Adibnazari, S. and Mehrabi, H., “Effect of Cell Size Change on Honeycomb Structure Equivalent Mechanical Property,” in Persian, 10th Iran Aerospace Conference, Tarbiat Modarres University, 2011. Galehdari, S. Kadkhodayan ,A.M. and Hadid-Moud, S., “Analytical, Numerical and Experimental Study of Energy Absorption of Graded Honeycomb Structure under In-Plane Low Velocity Impact,” in Persian, Tarbiat Modarres University, Vol. 14, No. 15, pp. 261-271, 2015. Liaghat, G. and Sarailou, H., “Optimum Design of Honeycomb Core under Compression Load,” in Persian, Technical and Engineering Journal of Modarres, Vol. 37, pp. 73-81, 2010. Chobini, M. and Liaghat, G., “Experimental and Numerical Investigation of Energy Absorption and Deformation of Thin-Walled Tube with Various Geometry Cross-Section under Lateral Impact Loading,” in Persian, Tarbiat Modares University, 2013. Meshkin zar, A. Darvizeh, M. and Darvizeh, A., “Analytical and Experimental Study of Thin-Walled Sections for Energy Absorption under Static and Dynamic Loading,” in Persian, Gilan University, 2012. Pirmohammadi, N. Liaghat, G. Pol,M. H. Sabouri, H., “Analytical, Experimental and Numerical Investigation of Sandwich Panels Made of Honeycomb Core Subjected Projectile Impact,” in Persian, Modares Mechanical Engineering, Vol. 14, No. 6, pp. 153-164, 2014. Damghani Nouri, Hatami, M. H. and Ghodsbin Jahromi, A., “Experimental Investigation of Expanded Metal Tube Absorber under Axial Impact Loading,” in Persian, Modares Mechanical Engineering, Vol. 15, No. 1, pp. 371-378, 2014. Zhang, Z. Liu, S. and Tang, Z., “Crashworthiness Investigation of Kagome Honeycomb Sandwich Cylindrical Column under Axial Crushing Load,” Thin-Walled Structures, Vol. 48, No. 4, pp.33-45, 2010. Zhang, Z. Liu, S. and Tang, Z., “ Comparisons of Honeycomb Sandwich and Foam-Filled Cylindrical Columns under Axial Crushing loads, “ Thin-Walled Structures, Vol. 49, No. 8, pp.1033-49, 2011. Ebrahimi, S. and VahdatAzad, N., “Multiobjective Optimization and Sensitivity Analysis of Honeycomb Sandwich Cylindrical Columns under Axial Crushing Loads,” Thin-Walled Structures, Vol. 88, No.7, pp.112-25, 2015. Forsberg, J. and Nilsson, L., “On Polynomial Response Surfaces and Kriging for use in Structural Optimization of Crashworthiness,” Structural and Multidisciplinary Optimization, Vol. 29, No. 5, pp. 232-43, 2005. Forsberg, J. and Nilsson, L., “ Evaluation of Response Surface Methodologies used in Crashworthiness Optimization,” International Journal of Impact Engineering, Vol 32, No. 6, pp. 759-77, 2006. Saltelli A, Chan, K. Scott, E.M., “Sensitivity Analysis,” John Wiley & Sons, 2000. Sobol, I.M., “Global Sensitivity Indices for Nonlinear Mathematical Models and Their Montecarlo Estimates,” Mathematics and Computers in Simulations, Vol. 55, No. 3, pp.271-280, 2001. Sobol, I.M., “Sensitivity Analysis for Nonlinear Mathematical Models,” Mathematical Modeling & Computational Experiment, Vol.1, No. 2, pp. 407-14, 1993. Wierzbicki, T., “Crash Behavior of Box Columns Filled with Aluminum Honeycomb or Foam,” Computers & Structures, Vol.68, No. 11, pp. 343-67, 1998. Zarei, H.R. and Kroger, M., “Optimization of The Foam-Filled Aluminum Tubes for Crush Box Application,” Thin-Walled Structures, Vol. 46, pp. 214-221, 2007.